The green tree frog is bright green with a sharply defined light yellow stripe along the upper jaw and side of the body. They eat insects and small invertebrates. 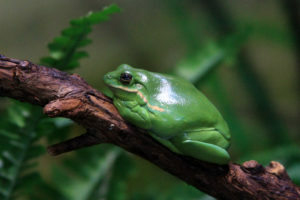 The green tree frog lives in vegetation near permanent water. During the day, they can be found sleeping on the underside of leaves or other moist shady places. Their range is from Delaware south along the coastal plain into Florida, west to south Texas, and north through Arkansas and Tennessee to Illinois. The green tree frog has a ringing bell-like call that can be repeated up to 75 times in one minute.